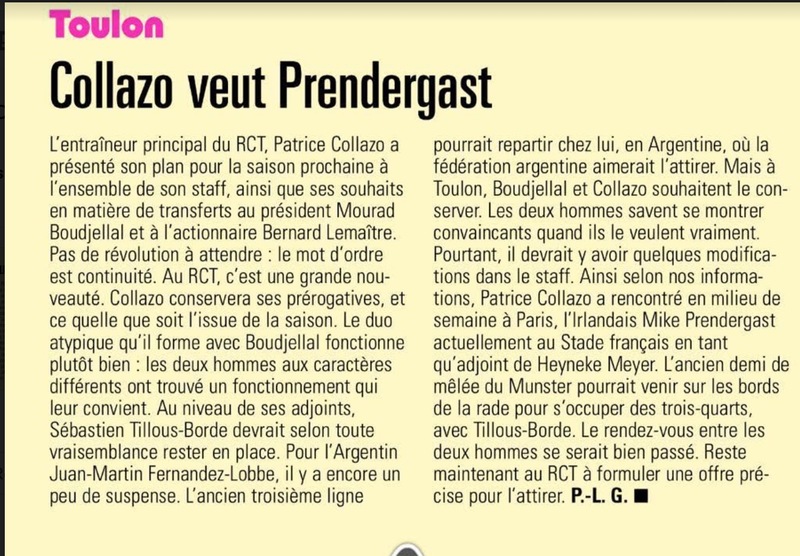 This morning's edition of French newspaper Midi Olympique has linked Mike Prendergast with a role at Toulon RC for next season. Prendergast, currently the attack coach at Stade Francais, is expected to be offered a role at the Southern rugby giants this summer. Toulon, owned by controversial character Mourad Boudjellal, are currently captained by Mathieu Bastareaud and coached by Patrice Collazo. Toulon currently lie in tenth spot, two slots on the ladder behind Prendergast's own Stade Francais. The former Munster scrum half has coached in the Top14 since 2013, when he joined Grenoble. The former director of rugby at Young Munster RFC also had a spell at Oyonnax before taking up a role with Stade Francais in Paris. It is believed that Prendergast met with Patrice Collazo in Paris last week as the head coach finalises his team for next season. The negotiations are set to be at the 'offer' stage, with Prendergast also in demand at his current club Stade Francais.